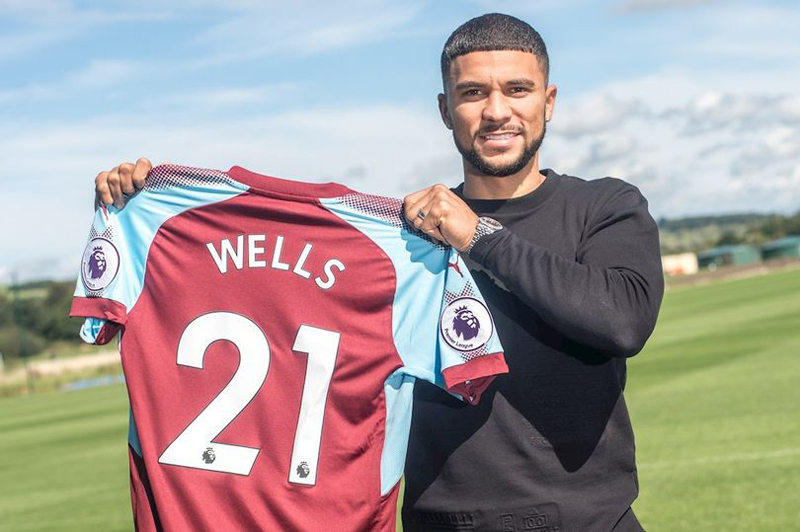 [Updated] Bermuda’s Nahki Wells made his second appearance in a Premier League game today [Dec 30], coming on for Burnley in the second half during their game against his old team Huddersfield Town, which ended in a 0-0 draw. The Bermudian footballer almost scored according to the club’s match report, which said, “Unlike the stalemate at Turf Moor in September, this game was not short of incident as the Clarets created chances either side of the break, with substitute Nahki Wells almost winning it late on against his former club. “Having replaced Hendrick with Sam Vokes, Dyche made a second change by sending on Wells for his second Premier League appearance following a debut from the bench against Tottenham a week ago to try and wrest back the initiative. “And with five minutes to go the ploy almost worked to perfection as the ex-Terriers’ striker was within a whisker of a first Burnley goal as he latched onto a knock-down from Vokes. Wells is the third Bermudian to feature in the English Premier League and the first since 2003. Kyle Lightbourne at Coventry City and Shaun Goater at Manchester City were the other two to achieve this feat, and legendary footballer Clyde Best played in the old First Division with West Ham. Update: After the match, Wells said, “It was good to be back in such a familiar place. I got a good reception from the home crowd, I’m just disappointed I couldn’t capitalise on the half-chance I had late on in the game. It was nearly a perfect ending. “Vokesy did well to put it in that area I can thrive on. I reacted to it and maybe just needed an inch more to get more on it, but it was also a great save. “I’ve had two Premier League appearances in the last three fixtures, so I’m delighted to be getting a chance. “I felt I’ve been working my socks off and I’m fully fit now. I think have a lot to offer to this side, so I will continue to try and take my chance when it comes. “I’m a bit a disappointed not to have that first Prem goal but the chance will come. “I have to be patient, of course, and keep working hard, because that’s what I was brought in to do. It was good to see him on the field again. He’s definitely hungry fit and has fight in him. They should have subbed him in much earlier.